A sturdy pine bunk bed, perfect for boisterous children. A solid pine bunk bed in an antique lacquered finish, The Chunky Solid Pine Bunk Bed is resilient & tough even for the most active of children. Mattresses are NOT included in indicated price. The Chunky Solid Pine Bunk Bed takes two 3 ft(190 x 90 cm) UK sized single bed mattresses, for safety reasons the one for the upper tier should have a depth no greter than 17.75 cm/7 ins approx.) - CLICK HERE if you require suitable mattresses. Delivered flat pack - assembly options available - please contact us if assembly service is required. 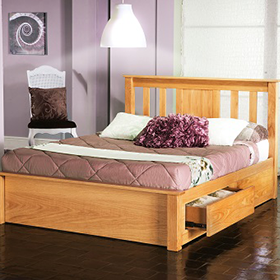 The Chunky Solid Pine Bunk Bed is delivered in approx. 3-5 weeks.